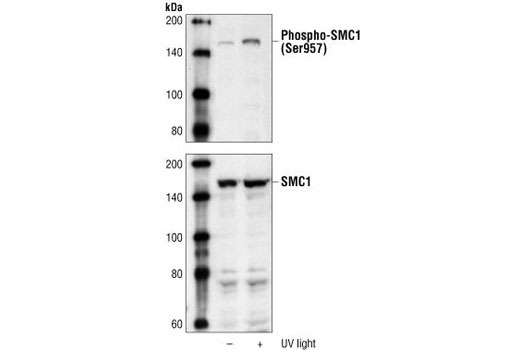 Western blot analysis of extracts from 293 cells, untreated or UV-treated, using Phospho-SMC1 (Ser957) Antibody #4801 (upper) or SMC1 Antibody (lower). SMC1 Antibody detects endogenous levels of total SMC1 protein. Polyclonal antibodies are produced by immunizing animals with synthetic peptides corresponding to residues near the amino terminus of human SMC1. Antibodies are purified by protein A and peptide affinity chromatography. Structural maintenance of chromosomes 1 (SMC1) protein is a chromosomal protein member of the cohesin complex that enables sister chromatid cohesion and plays a role in DNA repair (1,2). ATM/NBS1-dependent phosphorylation of SMC1 occurs at Ser957 and Ser966 in response to ionizing radiation (IR) as part of the intra-S-phase DNA damage checkpoint (3). SMC1 phosphorylation is ATM-independent in cells subjected to other forms of DNA damage, including UV light and hydroxyurea treatment (4). While phosphorylation of SMC1 is required for activation of the IR-induced intra-S-phase checkpoint, the precise mechanism is not well understood and may involve a conformational change that affects SMC1-SMC3 interaction (3). Michaelis, C. et al. (1997) Cell 91, 35-45. Sjögren, C. and Nasmyth, K. (2001) Curr Biol 11, 991-5. Yazdi, P.T. et al. (2002) Genes Dev 16, 571-82. Kim, S.T. et al. (2002) Genes Dev 16, 560-70.